Free time or another conference? If you were one of the approximately 725 students who acknowledged a call to ministry while in San Antonio for IYC2016, you chose the latter early in the afternoon on Monday. But it wasn’t just another conference. It was the huddle of a new team of emerging leaders ready to take on the world with the message of the gospel. Students were applauded for accepting their call to ministry, prayed for, and given practical tools and tips to get started on the path to Christ-centered leadership. One of the most powerful resources we have to equip and train such leaders is Church of God higher education. Long before thousands of students descended on San Antonio, Texas, for the fiftieth International Youth Convention, Anderson University, Mid-America Christian University, Warner Pacific College, and Warner University took practical steps to unite their efforts for the sake of leadership development. Every student who attended the Emerging Leaders gathering at IYC received a backpack. Inside each backpack were a variety of materials to help launch students onto their ministry path, including advertisements for each of the four Church of God schools. But new this year was a postcard that caught a lot people’s attention. On the front was pictured a scene from each of the four schools equidistant from a center text box that simply read, “Choose Church of God.” On the reverse side was printed a brief mission statement and contact information for each school. 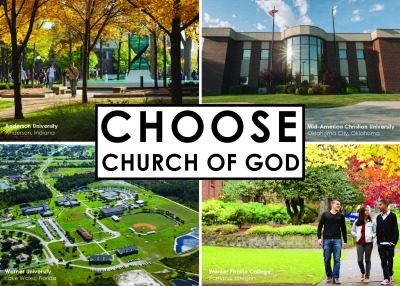 The Church of God is blessed to have four outstanding schools, and each one understands this fact. So it wasn’t too hard to get each one to band together to encourage IYC students to select from any one of the four. 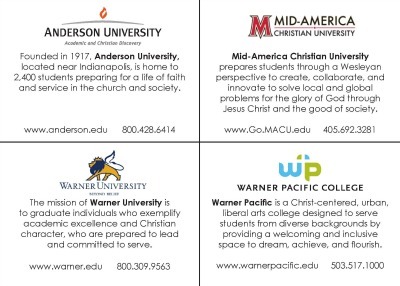 Serena Cline, director of alumni relations and annual giving for Warner Pacific College, explains. This entry was posted in All Church of God, Colleges & Universities, IYC: International Youth Convention, Youth Ministries and tagged admissions, Anderson University, AU, college, higher education, International Youth Convention, IYC, IYC2016, MACU, Mid-America Christian University, post card, postcard, unity, university, Warner Pacific College, Warner University, WPC, WU. Bookmark the permalink.